Turn your morning coffee ritual into a work of art. 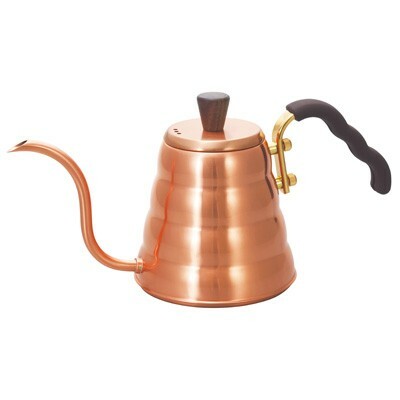 The new Hario Buono Coffee Drip Kettle hearkens back to your grandmother's copper-clad cookware and makes a bold statement in the modern age of stainless steel and glossy plastic. But, its looks are more than skin deep, the kettle continues Hario's quality design with an ergonomic handle in contrasting brass and a rich, mahogany-hued lid knob. The Buono's function is as beautiful as its form; delicate streams of water coalesce from the classic gooseneck spout in easily controlled portions for amazing pour over accuracy. Show-stopping - The classic Buono beehive shape trades in its stainless steel roots for a look that will put the rest of your kitchen appliances to shame. Gooseneck Spout - The angled pour spout offers impressive control over water flow ideal for pour-over cones or other delicate applications. Ergonomic Handle - Cast in contrasting brass, the angled handle sports ergonomic curves made for fingers. Gorgeous - Copper is the king of fancy kitchenware, and the honeycomb shape of the kettle makes it sparkle from every angle. Control Freak - But in a good way! The bottom-mounted spout and narrow neck make controlling the flow of water a breeze. We liked it better than the Bonavita's gooseneck. Quick Heat - The smaller 0.9-liter size and wide base gets water up to temperature fast (and makes the kettle easier to pour). Loose Lid - While it doesn't effect usage in any way (thanks to the gooseneck's low mount point) we wish the kettle's lid was just a bit more snug. Hot Handle - The brass handle gets quite warm when heating on a stovetop. The gooseneck spout offers the same great level of control as on the classic steel Buono, but the curved brass handle is more comfortable in the hand than the latter's plastic. Make sure the steam vent holes are facing away from the handle, for obvious reasons. Rinse out kettle after every use. Descale interior of kettle as needed. We use Dezcal.